“On learning the latest results from the precision travel scales”. 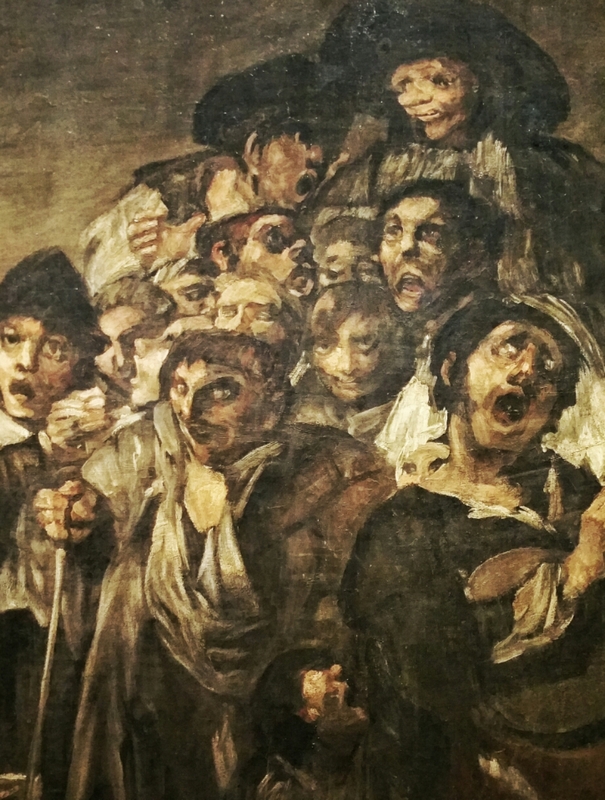 Closely modelled on Goya’s very similar black painting. I had a nice short visit to the Prado today. It is so vast that without care a trip here becomes a pleasure-free grind. I love most of all, the Velazquez, the El Greco, and the Goya collections, which are unmatched anywhere in the world. This is about 5% of the total hangings, and the rest leave me cold. So I make a beeline for my favorites, take my time and ravish my eyes, and I’m still done in an hour. There is also at the moment a wonderful temporary show of Goya and his contemporaries in Madrid, and it’s worth the trip just for that. Oh, and until September, 10 excellent Picassos spanning his whole career, on loan from the Basel Kunstmuseum. I’m no art expert, but I can now distinguish a Velazquez, or El Greco (very easy) or a Goya from their nearby contemporaries and be right 80% of the time. Not much of an achievement, but pleasing nonetheless. I should also mention that my favorite restaurant in Madrid at the moment for price and creativeness, Tricyclo, is only a 10 minute walk away from the Prado. So fun in every dimension (except the waistband).